Fresh fruits, healthy snacks, the latest toys, a quality bicycle, you only want the best for your children. The same applies when it comes to school, you want your child to study at the best school in Kathmandu. With an extensive and balanced curriculum, supportive teachers, and top-notch facilities, Samriddhi School is one of the best schools in Kathmandu. Studies have shown that perceived caring from teachers increases the children’s motivation to achieve positive social and academic outcomes in school. At Samriddhi, we have a progressive pedagogy, with our teachers adopting a caring and attentive stance towards our students. This includes hands-on activities, experiential learning, community engagement, critical thinking approach, communication, and collaboration. Unlike other schools, Samriddhi school in Kathmandu builds quality lives and strong culture through our core values: compassion, excellence, respect, integrity, responsibility, teamwork, and service; all of which are cultivated into our students. Understanding the current needs of students, Samriddhi School tries to connect the dots by practising global Science, Technology, English, Arts, and Mathematics (STEAM Education) in the curriculum. It is an interdisciplinary approach where the concepts from various subjects are integrated together rather than teaching each subject individually. This learning approach emphasizes project-based learning and focuses on finding a solution to real-world problems. STEAM education also gives an opportunity for students to explore and discover their creative pursuits at our exceptional school in Kathmandu. With its incorporation, we intend to spark the children’s interest by exposing them to STEAM’s diverse disciplines. As one of the best school in Kathmandu, we have three different engaging laboratories viz. Mathematics, Science and Language. Mathematics facilitates a way of thinking, organizing a logical proof, and a way of reasoning. To facilitate directed discovery, learning and develop analytical thinking, we provide the students with well-equipped mathematics labs, where our highly qualified and experienced mathematics’ faculty impart a strong logical orientation to students. Besides, Abacus training is incorporated into mathematics with a broad aim to enable children to maximize the use of their brain power. It also helps in improving their problem-solving skills and enhancing their attention span, memory, and observation. In addition, laboratory activities provide a starting place for the systematic development of students’ ideas, and a testing ground for the predictive power of their reasoning. With a nurturing environment at this school in Kathmandu, the science lab provides opportunities for students to interact directly with the material or with data drawn, using the tools, data collection techniques, models and theories of science. Studies have shown that students in hands-on-science program will remember the subject matter better, and be able to transfer that experience easier to other learning situations. As a remarkable school in Kathmandu, Samriddhi School believes in giving global exposure to our students, thus inspiring them to achieve their goals in life. A language lab creates a learning environment much more effective than traditional classrooms, allowing them to develop several classroom exercises, personalize the learning process, and encourage creativity, innovation, and training. To enhance the overall experience of studying at a well-regarded school in Kathmandu, we have also incorporated a wide range of extra-curricular activities into the curriculum. From sports like basketball and futsal to dancing, singing and drama-as a dynamic school in Kathmandu, we empower our students to balance their studies and co-curricular activities so that they become well-rounded individuals in the future. For this, we have also organized various programs like 3×3 basketball competition, futsal competition, Sports Day and Parents Day. As a school in Kathmandu that fosters the diversity in the students’ personalities, Samriddhi School unites them to make them productive, socially responsible members of the society. Such events comprise of Saraswoti Puja, photography training and workshop, personal wellness program, critical thinking in the classroom, a clean place is a safe place, SMART rescue camp, Holi program, free health camp, educational tour, to name a few. As a modern school in Kathmandu, we have restructured our classes as smart classrooms. A smart classroom is an innovative methodology, which aims at transforming the teaching techniques from a traditional, industrious method of verbal explanation to a very interactive and graphical presentation which makes learning smooth and fun for the students. Serving as a digitally enhanced school in Kathmandu, Samriddhi School understands the current trends and thus, Information and Communication Technology (ICT) is taught as a stand-alone subject from class I onwards. This school in Kathmandu aids them with computer studios that have high-grade computers and multimedia projectors, interactive smartboard, a 3D printer and carefully monitored and filtered internet connectivity. Each child is provided with his or her own workstation and access to an individual computer. Essentially, we spare no effort to prepare our learners for the global society and IT-driven world within the premises of our school in Kathmandu. A qualified career counsellor guides the students to recognize their talents and aptitudes at this school in Kathmandu. Some of our learners have special physical, social, emotional or academic needs. With the consent of their parents, our professional counsellors can help them deal with their temporary and long-term difficulties. Samriddhi school in Kathmandu is associated with Grande Hospital to look after the health of our students. A full-time qualified nurse is on duty during the school hours to look after the infirmary and attends to the first aid needs of the learners. As an honourable school in Kathmandu, we also provide a spacious library with a well-indexed stock of storybooks, text and supplementary books, newspapers and magazines. There is also a resource room attached to the library with more computers available for student access. The Cafeteria provides light nutritious snacks at a reasonable cost. The school’s Android and iOS app lists daily menus and nutritional information, giving students the chance to plan their meals with ease. Similarly, the smart payment system eliminates the hassle of carrying cash every day to this school in Kathmandu. Samriddhi School in Kathmandu provides transport facilities on specified routes under a safety vehicle scheme which ensures that your child reaches home safely and securely. Parents and guardians can track the vehicle movement with the school’s app and learn the precise location of the school buses enroute from our school in Kathmandu. 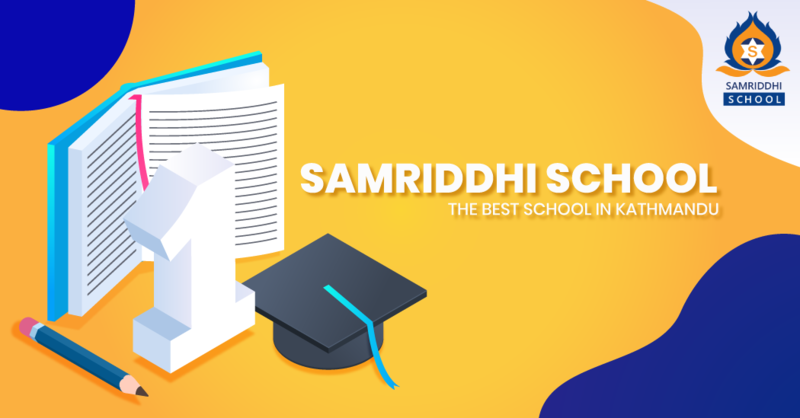 Samriddhi School is committed to inspire and motivate students to achieve the highest standards of intellectual development as well as personal growth, through a stimulating and comprehensive educational program. In terms of overall academic orientation, we place a pronounced emphasis on STEAM education along with other domains critical to overall academic achievement and sustained academic excellence.On the bright side, our admission opens for Grade I to Grade IX level students for 2019. The new classes start in the first week of Baisakh. So, if you are looking for the best school in Kathmandu that provide quality education for your children, then you should look for Samriddhi School. For more information about our school in Kathmandu, please visit our website or Contact us- 014390590/ 4383777.